MainAll NewsDefense/SecurityDid Israel Cave to Terrorists’ Hunger Strike? Did Israel Cave to Terrorists’ Hunger Strike? Outrage over reports that Israel has reached a deal with Hamas over hunger striking terrorists. Israel has reached a deal with Hamas regarding hunger striking terrorists in Israeli prisons, Channel 2 news reported Sunday night. The deal was signed three weeks after dozens of prisoners suspected of terror offenses stopped eating. According to the report, some of the prisoners will be released, and others will enjoy better conditions. MK Michael Ben-Ari of Ichud Leumi (National Union) condemned the agreement. “Netanyahu’s ‘just talk’ government has folded yet again instead of striking with an iron fist,” he said. “It turns out that baby killers will keep living the high life in Bibi’s rest center,” Ben-Ari added. 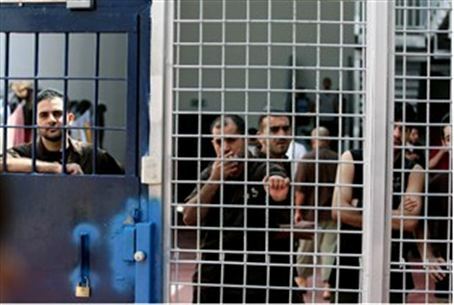 Many PA prisoners are on hunger strike in protest of Israel’s policy of using administrative detention. In addition, dozens of Egyptian prisoners have announced a hunger strike following the cancelation of a prisoner exchange in which they were to be freed. Hamas has threatened Israel with increased violence if a hunger strike prisoner dies.